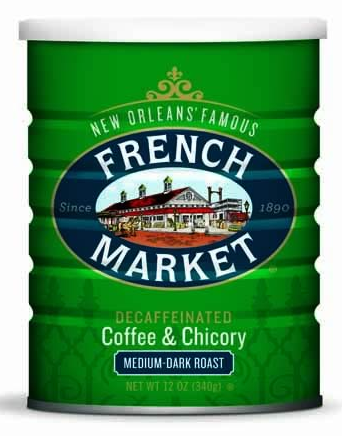 Home > New Orleans Drinks > French Market Coffee and Chicory Decaf Can, 12 oz. Perfect coffee to satisfy die-hard coffee drinkers without all that caffeine! 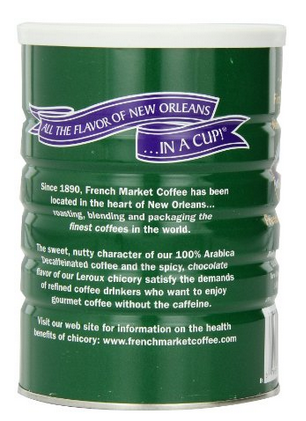 French Market Coffee and Chicory is a bold and rich blend of 100% Arabic coffee beans and chicory that is available in decaf. This decaffeinated coffee is a perfect eye opener . An Ethyl Acetate process is used to decaffeinate the Coffee and Chicory blend. Ethyl Acetate is a natural chemical found in many fruits. 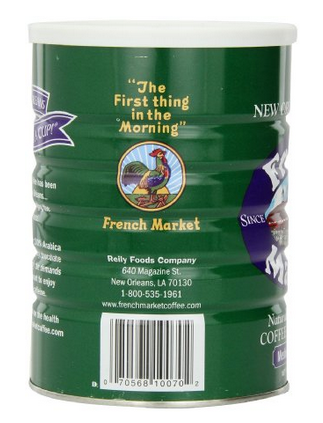 This great tasting 100% Arabica French Market decaf coffee will satisfy die-hard coffee drinkers without all that caffeine!